And he’s off! 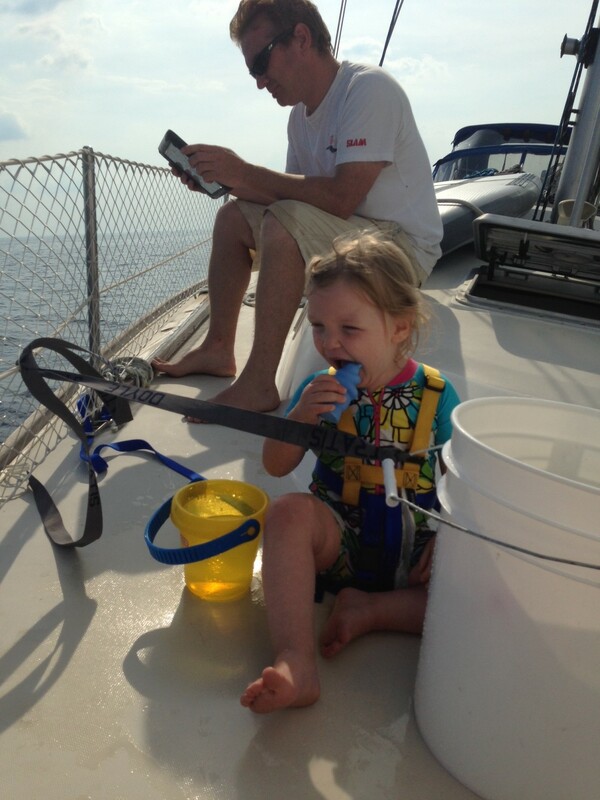 Aaron and the crew of Turning Point are just a few hours into the Race to Mackinac. It’s the 107th year for the race, and Aaron’s 10th running. 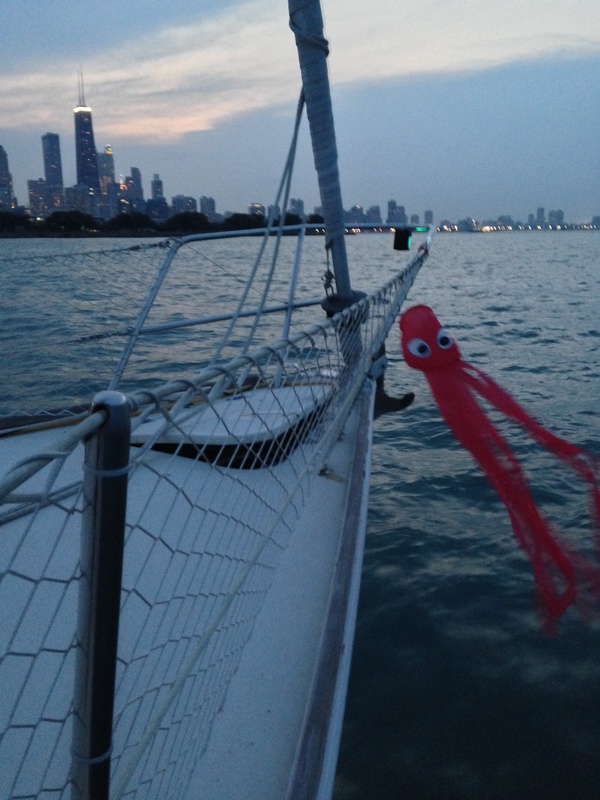 After toasting with some Champagne last night at the dock party at Chicago Yacht Club, one of the sponsors of the race, we headed back to Clarity so Aaron could get some solid sleep before managing shifts for two or three days with a crew of nine. Claire and I said our goodbyes this morning and dropped him off at the boat in a flurry of last-minute prep before they cast lines. In addition to putting Aaron at a decade of Mac Race experience, this year is also a special one because, for the first time with Turning Point, he’s part of the driving team, which means he’ll be at the helm during his shifts. It’s a great honor, and one he’s worked hard for. You can track the Turning Point crew throughout the race from your computer, or you can download the free YB Tracking app to your phone or tablet. Aaron’s boat is in the Beneteau 40.7 division, and the maps often load faster if you de-select most or all of the other divisions. As he makes is way to a well-deserved rum drink at the Pink Pony on the island, Claire and I will be holding down the fort(s) here. I’m sure we will find plenty of our own trouble to get into :). Aaron and the rest of the Turning Point crew on the podium at Mac Island. 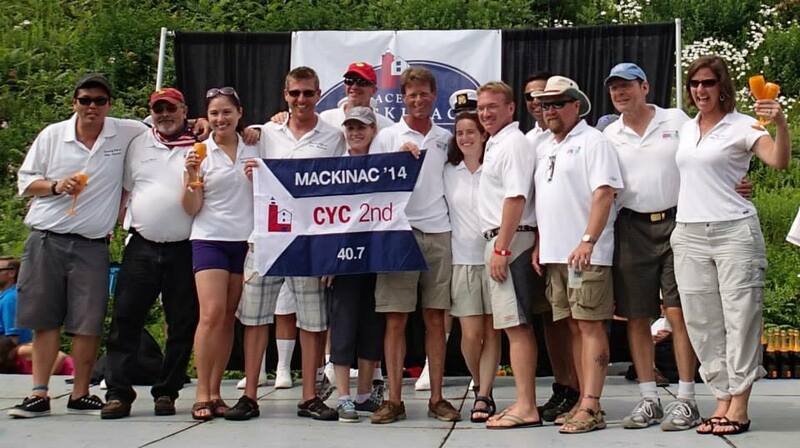 They won 2nd out of 11 boats in the Beneteau 40.7 division. On Wednesday evening, we got our captain back! 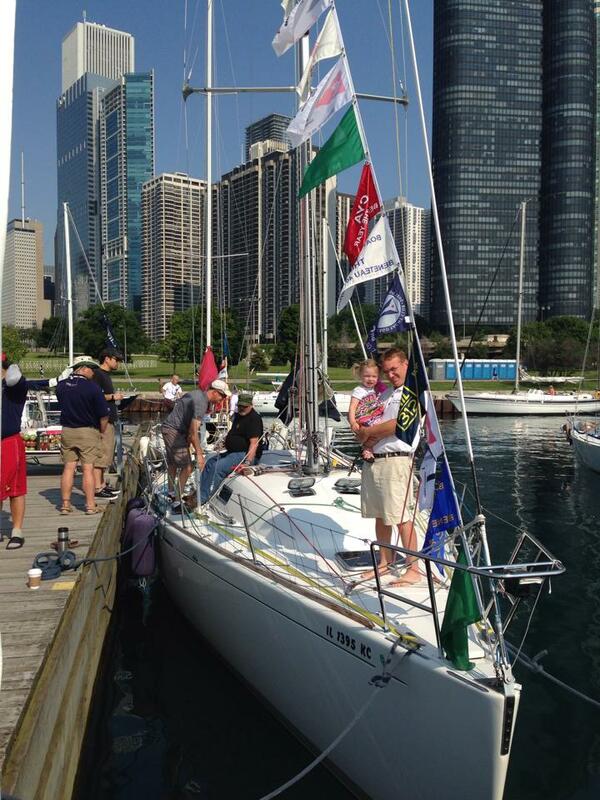 Aaron made it home safe and sound after sailing up Lake Michigan with 333 boats during the 106th Race to Mackinac. For those who are unfamiliar, the race is the oldest annual freshwater race in the world, and crews come from all around the country to compete. For Midwest racers, it’s a rite of passage. I’ve talked to enough of them to know that, though the finish line never varies, the course and the experience are completely different from year to year. 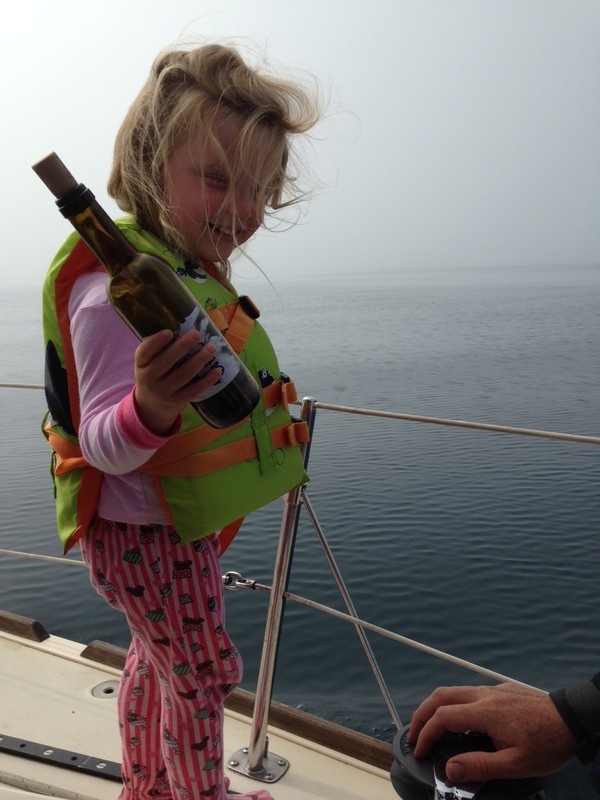 The wind and the weather can throw some crazy curveballs – even if the curveball is the wind shutting off completely and stranding boats in the Straits with the Island just a handful of miles away. Sometimes, they even have to drop anchor to prevent going backward. This was Aaron’s ninth Mac Race, and I think it was a special one for our family. 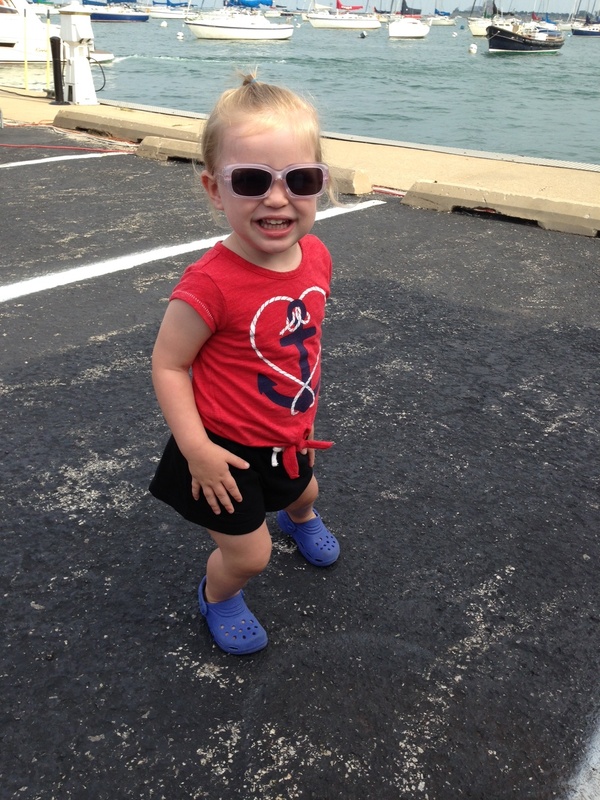 It was right after the race three years ago that I found out I was pregnant with Claire. Two years ago, the demands of a colicky infant made Aaron leaving for five days impossible, and last year, we had just returned from a month-long trip on Clarity, so the demands of work took precedence. During the bitterly cold and unrelenting winter, Aaron started talking about getting back to the Mac Race – albeit with some trepidation. Most racers that have done it have cursed it and said they’ll never do another – the biting flies, capricious winds, 10+ crew members in tight quarters that don’t shower for three days. I’ve never raced the Mac and honestly have no interest to, especially because it seems to me that oftentimes, they do it because they can’t not do it. 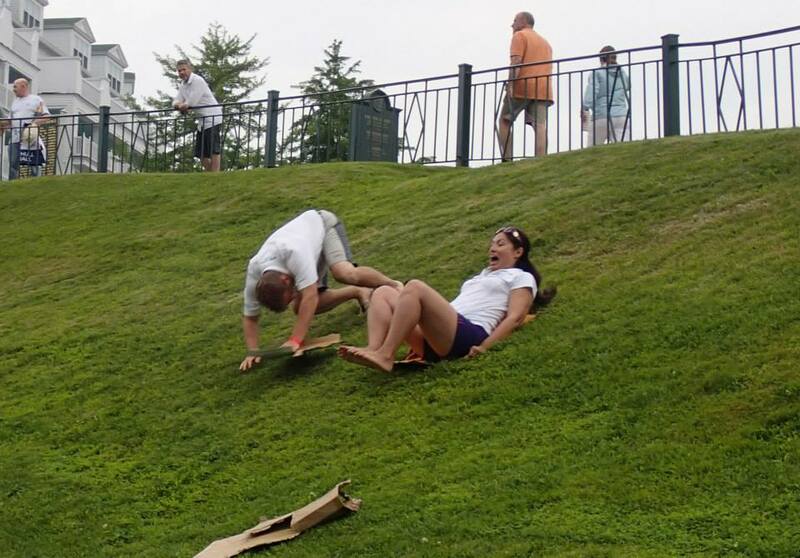 Also, it’s not for the faint of heart, as some might recall what happened three years ago. Overall, though, the race is an opportunity to be part of something truly special, and it means a lot to Aaron. Aaron races on Turning Point, a Beneteau 40.7 that he’s been with for many years. The week before the race, Aaron went out for practice with the crew, practiced sail peels, and helped with final systems checks. Grandma watched Claire on Friday so Aaron and I could have a date night before he left the next morning. Would you believe it? 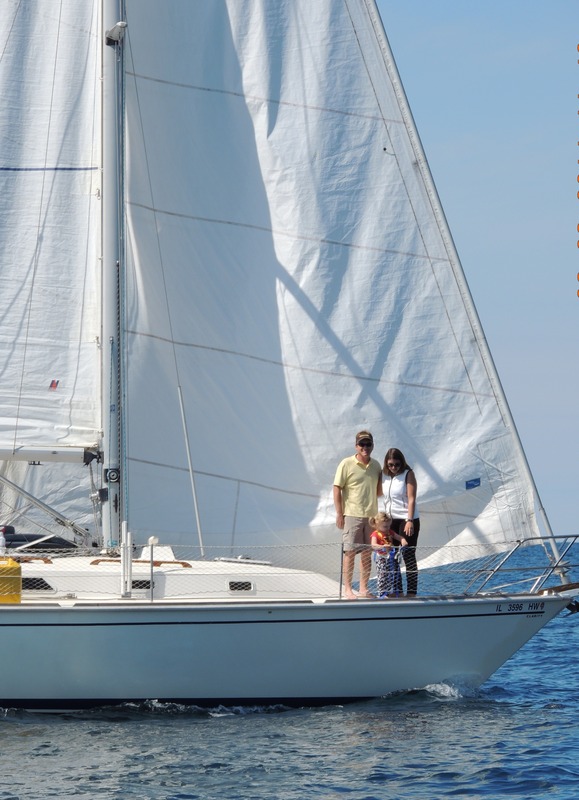 I made him take Clarity out sailing with me – our first chance to sail it without its namesake this summer. He even surprised me with a man overboard drill. We’re just nutty that way. A hug on the bow with Claire before we sent him on his way! Saturday morning, Claire and I dropped Aaron off at the Columbia dock and Turning Point crossed the starting line just a few hours later. We were able to track his boat online for the next two days, and I’ve done this enough now that I have a sense of whether or not things are progressing well. Turning Point rocked it. After light winds made for slow progress on Saturday, they picked up on Sunday and come Monday, the crew rocketed up past the Manitou Islands, through the Straights, under the Mac Bridge and all the way to that blissful cannon fire at the finish line that signifies the Champagne and rum can start flowing. In the meantime, Claire and I had a lovely time at home in Oak Park visiting with friends, going to barbecues, taking over the pool; basically gallivanting around town. I was quite relieved, though, when Aaron made it home Wednesday evening. Five days by myself with a rambunctious 2-year-old is no joke. One thing I truly missed, though, was our family time on Clarity! I can’t wait to get back there in the next day or two, and resume our own adventures. Island celebrations! 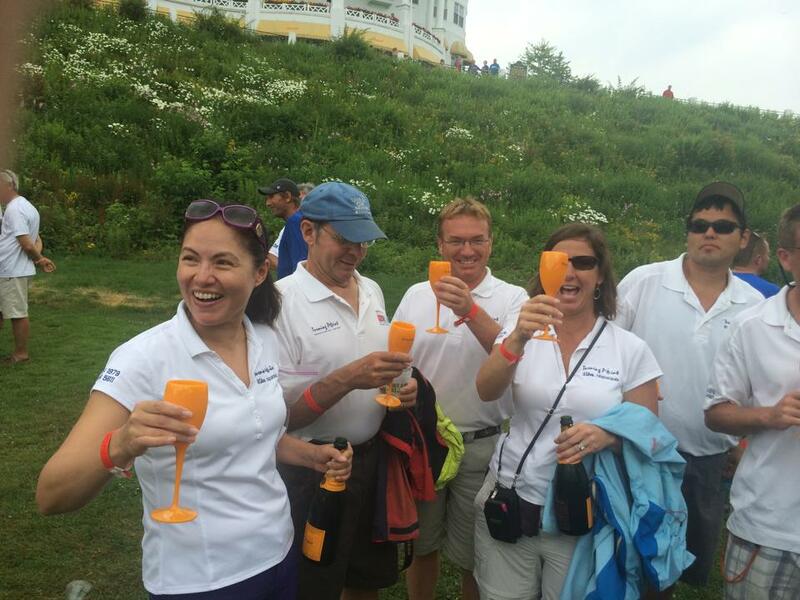 Veuve Clicquot is a sponsor of the race. Island shenanigans… From what I understand, rum had nothing to do with this! Our first Lake Michigan crossing of the season is complete! 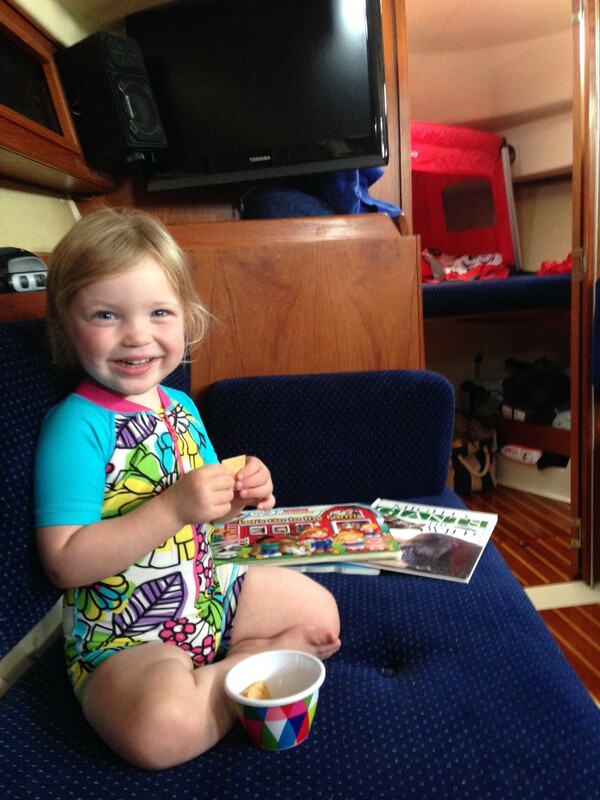 We had been tentatively planning our first family trip for this weekend, but there’s a lot to consider when you’re sailing, and it tends to dictate the destination. I looked into heading to New Buffalo, MI – a stop that we skipped during our month-long adventure last year. But our boat draws 6.5 ft., and some Michigan harbors aren’t that deep (one of the tradeoffs of getting a boat with a fin keel rather than a shoal keel, which is only 3 to 4.5 feet.) So, New Buffalo was out. We also considered sailing up to North Point Marina, right on the border of Wisconsin, or over to St. Joesph, Mich. But those are longer sails, and yesterday morning, the lake was powerless to a bear hug of fog that the sun didn’t burn off until right around noon. 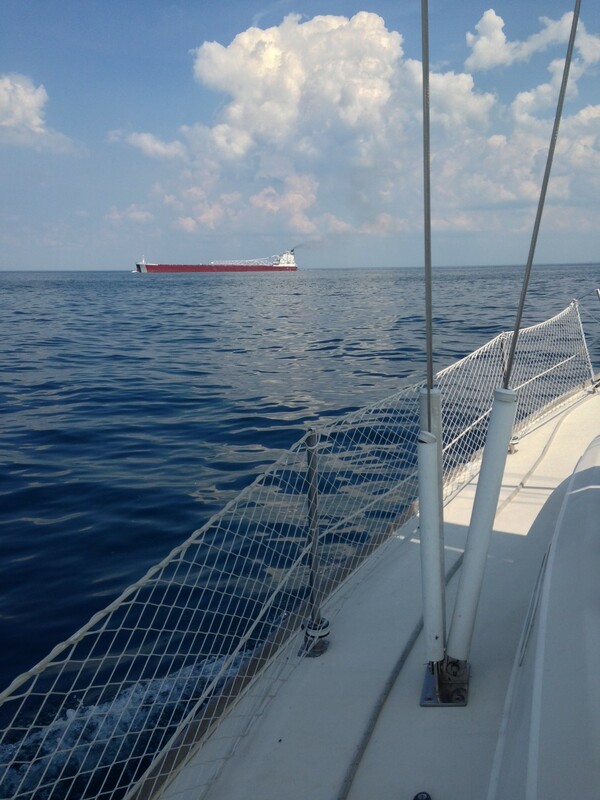 Thirty miles away, Michigan City, Ind., seemed like a great alternative and a comfortable 6- to 7-hour sail. Plus, their marinas are plenty deep. We cast lines at about 12:30, settled into our 100-degree point of sail and more or less followed it all the way here. The winds were 5 to 10 knots out of the southeast, so we couldn’t just sail the whole way, but we were able to motor-sail for a fair portion of it with both the jib and the main flying. Aside from a pesky swarm of biting flies that set up camp in our cockpit, the trip was lovely. Claire ate her weight in crackers, took a two-hour nap and played with some of her animals up on the bow. Claire shows her hippo who’s boss while Aaron checks our course. We also made friends with a passing freighter. These longer sails are also great opportunities to shake off the cobwebs a bit, and we realized that we have a potentially failing battery in our house battery bank. It wasn’t a problem during the crossing, as we switched to our other battery and always have an emergency starting battery on board. But, it’s another project for Aaron to add to his list. The boat does a great job at keeping that full. Clarity pulled into her slip for the weekend in the Michigan City Port Authority Marina at around 6:30 and I made a chicken stir fry dinner while Aaron took Claire for a walk to scope out the sights. With full bellies and a sleeping toddler, Aaron and I collapsed on the deck with margaritas to watch the sun set over Lake Michigan. Today, we’ve been exploring our haven right by the marina – a playground, splash pad, zoo and the beach, all a short walk. Details about our on-land adventures to come. For now, it’s time to explore! It was five hours into our crossing from Chicago to South Haven, Mich., last summer when I knew things were going to go downhill. The sail started out great. Minimal waves, good breeze and a nice but non-threatening overcast that prevented the sun from beating down on us. Then two or three hours in came the swarm of biting flies, so thick that you couldn’t see white on the deck and so hungry for a place to land that all three of us had to put on pants and long-sleeve shirts just to maintain sanity (and even then, I don’t mind saying that I lost it a few times). But finally, all of a sudden, as quickly as the flies had come in, they were gone. 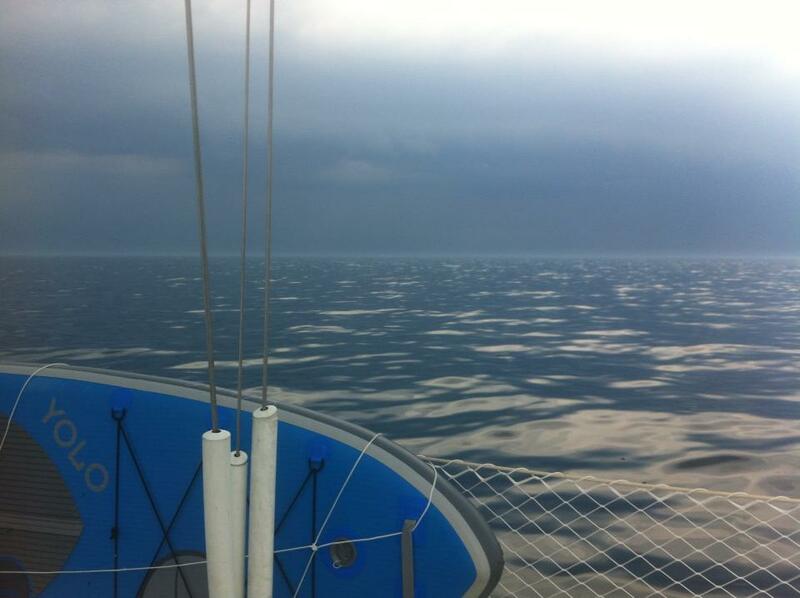 We could breathe again, though the wind disappeared and made actual sailing impossible. It was getting to be lunchtime, so I put Claire down below for her nap and Aaron and I grabbed a bite on the bow while our pal Auto drove us through glassy water for awhile. And then we realized why the flies had left. Slowly but surely, the wind established itself in a new direction and began to build as the storm approached. 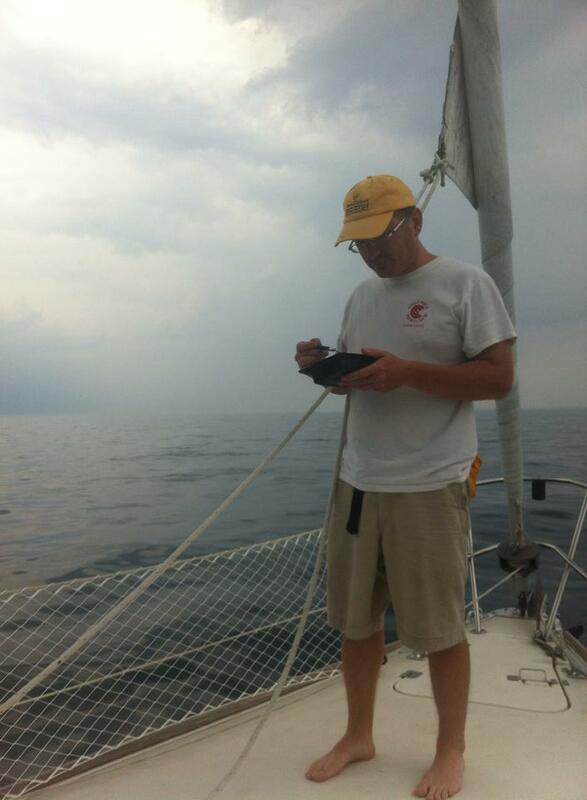 We had checked the marine forecast fastidiously before we departed in the morning and though there were some storms forecasted, they were supposed to be closer to shore, near New Buffalo and St. Joe – a fair distance southeast of our course. But, as can happen, this one tracked further north than was predicted. The pouring rain wasn’t that bad, really. Aaron and I have sailed in it before and, though a little unpleasant, it’s perfectly manageable if you’re wearing the right gear. The height of the storm only lasted 15 or 20 minutes, and Claire slept through the whole thing – a miracle! But what the storm lacked in length, it made up for in shifting winds, kicking up the waves and making Lake Michigan a washing machine. And it stayed that way, after the storm passed, after the sun came out. Also, by that point in the day, we just wanted to get to South Haven as quickly as possible. This required sailing in the ditch – the absolute worst approach to the waves. When I felt that first pang of seasickness, I knew it was just a matter of time, and I perched over the side of the boat, fingers and toes clenched, and waited. And it came. Again, and again, and again. I’ve had bad motion sickness for most of my childhood and all of my adult life. Those twirly rides at carnivals, simulation games, tiny planes, and yes, big waves – these are my nemeses, to be avoided at all costs. But as soon as Aaron and I started dating, I was out on sailboats more and more and became determined to overcome it (especially after some embarrassing dates early on). BUT, contrary to what my doctor told me, it has gotten more and more manageable the more time I spend on the boat. 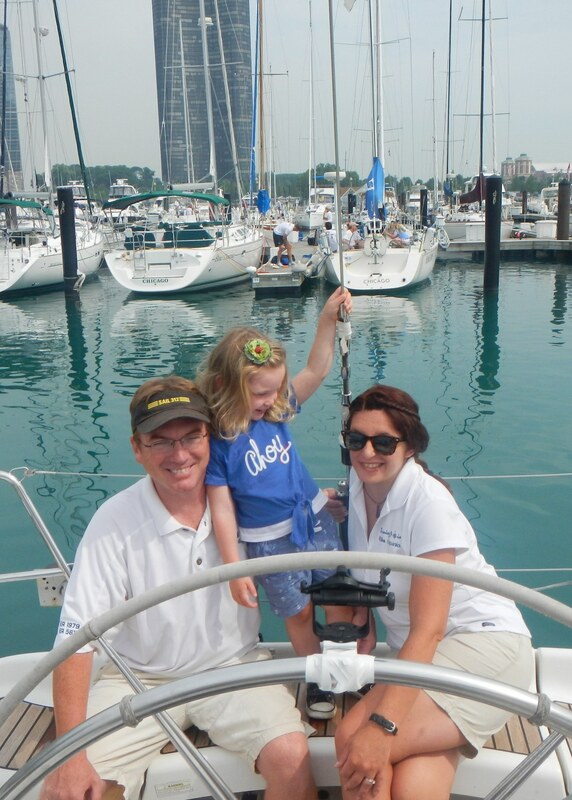 In all of the sailing we did last year, I only got physically ill twice – first, during that South Haven crossing, and then during a sail from Racine, Wis., to Milwaukee – a story for another day. I even do relatively well in bigger swells now, and I can go down below in most conditions. Heck, I’ll even fix us lunch in the galley while the boat is tossing anything that isn’t secured like popcorn in the microwave. It’s predominantly when the winds and waters are confused and kick the boat around in every direction at the same time that I can’t overcome it. And in most cases, the best medicine for me is just to have a job and stay focused on it, keep my mind off of it as much as possible. Incidentally, Claire also became seasick on those two occasions, and on that crossing to South Haven, when she came up from her nap, it took her about 15 minutes or so of sitting on my lap in the cockpit before she got sick on me as I was sick over the side. I have never appreciated solid ground and a hot shower more than when we finally docked at South Haven that night. Unlike for me, though, who stays sick for the rest of the day once it’s set in, she was smiling and singing songs again as soon as it had passed. You can’t foresee everything, but the marine forecasts are pretty reliable. And that’s why, on some perfectly sunny, warm days – such as this past Sunday – we’re docked at the harbor. These same days sometimes bring winds of 15-20 knots and 6-to-8-foot waves. Not my prescription for a pleasure cruise. I don’t think I’ll ever fully shake the seasickness, but life on the water is worth it to me. And if it means we’re a little more conservative with when we go out than other boats, so be it. I must keep remembering – we’re cruisers! Having fun sailing isn’t just desirable – it’s required.